The human brain owes its characteristic wrinkled appearance to its outer layer, the cerebral cortex. During human evolution, the neocortex, the evolutionarily youngest part of the cerebral cortex, expanded dramatically and had to fold into wrinkles to fit inside the restricted space of the skull. The human neocortex supports advanced cognitive skills such as reasoning and language. But how did the human neocortex become so big? The answer may lie in genes that are unique to humans, such as ARHGAP11B. Researchers at the Max Planck Institute of Molecular Cell Biology and Genetics in Dresden found that this human-specific gene, when introduced into the developing brain of ferrets, can cause an enlargement of their neocortex. ARHGAP11B causes neural progenitor cells, which are cells that produce neurons, to make more of themselves for a longer period of time. The result is an expanded neocortex. The human neocortex is roughly three times bigger than that of our closest relatives, the chimpanzees, and is the seat of many of the higher cognitive functions that are unique to humans, such as our speech or the ability to learn. A key question for scientists is how in human evolution the neocortex became so big. 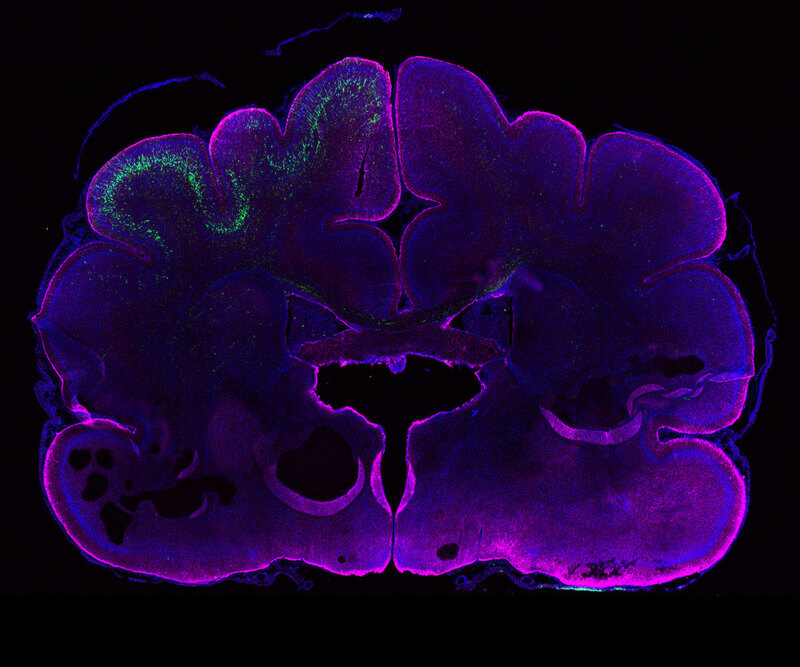 In a 2015 study, the team around Wieland Huttner, research group leader at the Max Planck Institute of Molecular Cell Biology and Genetics, found that under the influence of the human-specific gene ARHGAP11B, mice produced much more neural progenitor cells and could even undergo folding of their normally unfolded neocortex. The results suggested that the gene ARHGAP11B plays a key role in the evolutionary expansion of the human neocortex. There are two types of neural progenitors in the mammalian neocortex: apical and basal. A subtype of the latter, called basal radial glial cells, are driving neocortex growth in human development. Unfortunately, mice have very few of them, which makes mice unsuitable to test whether the human-specific gene ARHGAP11B – via its effects on basal radial glial cells – can indeed cause an enlargement of the neocortex. A team of researchers from the research group of Wieland Huttner now investigated what ARHGAP11B would bring about in a ferret brain. Ferrets have a larger neocortex than mice and possess more basal radial glial cells. The first author of the study, Nereo Kalebic, explains what he was able to observe: “In ferrets, ARHGAP11B noticeably increased the number of basal radial glial cells. It also extended the time window during which the basal radial glial cells produced neurons. As a result, these ferret brains contained more neurons and thus had a bigger neocortex.” These results suggest that ARHGAP11B may have a similar role in the developing human brain. This study also provides the first evidence of a human-specific gene increasing the number of basal radial glial cells in a folded neocortex. 1 Comment on "Researchers Discover Human-Specific Gene for Building a Bigger Brain"